Facebook Inc., the world’s largest social-networking site, said members registered new user names at a rate of more than 550 a second after the company offered people the chance to claim a personalized Web address. Facebook started accepted registrations at midnight New York time on a first-come, first-served basis. Within the first seven minutes, 345,000 people had claimed user names, said Larry Yu, a spokesman for Palo Alto, California-based Facebook. Within 15 minutes, 500,000 users had grabbed a name. Ok. This is just what I've always wanted really. A quick'n dirty personal blog. Here we go. Boy am I going to enjoy this. Daniel Dresner once broke bloggers down into two groups, the "thinkers" and the "linkers". I probably would be immodest enough to suggest that most of my material falls into the first category (my postings are lo-o-o-ng, horribly long), but since I don't really fit any mould, and I am hard to typecast, I also have that hidden "linker" part, struggling within and desperate to come out. Which is why Facebook is just great. In addition, on blogs like this I can probably only manage to post something worthwhile perhaps once or twice a month, and there is news everyday. So, if you want some of that up to the minute "breaking" stuff, and are willing to submit yourself to a good dose of link spam, why not come on in and subscribe to my new state-of-the-art blog? You can either send me a friend request via FB, or mail me direct (you can find the mail on my Roubini Global page). Let's all go and take a long hard look at the future, you never know, it might just work. "As long as excessive debt is not digested, both monetary and fiscal policies are inefficient. There is not much of an alternative. Either to let the economy collapse, in order to reduce debts, and then use fiscal policy to revive it, or inundate the insolvent economy with public credit, to avoid the collapse, and loose the ability of fiscal policy to pull it out of a prolonged lethargy. Either a horrible end or an endless horror." Well, I think the title to this post makes my view on the high-profile shenanigans we are currently witnessing on the part of two widely respected contemporary intellectuals clear enough, even if Paul would probably respond that he is perfectly well able to take care of himself, thank you very much. Nonetheless, looking at the way the tone of his most recent and most public debate with Niall Ferguson has deteriorated (yes, it is Niall I'm talking about here, and not Sir Bobby, although sometimes even I have my doubts), let me confess, I am not entirely convinced on this point (Niall Ferguson's argument can be found summarised in his Financial Times Op-Ed here, and in his rejoinder letter to Martin Wolf reproduced by the FT Alphaville's ever interesting Izabella Kaminska here, while Paul Krugman's "input" to the debate can be found here, here, and here). So, since the thunder and lightening that such high profile exchanges generate tends to obscure more than it reveals, let me be so bold as to add my own 2 centimes worth - even if, apologies in advance, the whole affair ends up being most terribly "wonkish". If you want to save yourself a good deal of trouble, and heart searching, the central point is a simple one: are long term US interest rates rising because investors are worrying about having to buy so much public debt (as K would point out, what else were they thinking of doing with the money - which isn't really "money" at all, but, oh, never mind), or are they rising because investors expect the time path of US short term interest rates to move steadily upwards? It's as easy, or as hard, as that. So now, you decide! 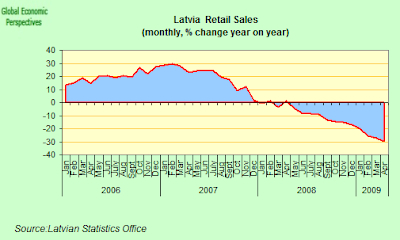 Latvia - Devalue Now or Devalue Later? The Latvian economy is certaily stuck in a hard and not especially pleasent place at the moment, and really one chart tells it all, since as we see above the local interbank overnight interest rates have been storming upwards and through the roof over the last two weeks. As a result of this unfortunate state of affairs the country has attained a higher profile in the international news media than most Latvians would ever have dreamt possible, or even, probably, considered desirable. Ever since Claus Vistesen's last post, my inbox hasn't stopped filling up with reports, analyses, forecasts etc. (apart from Claus, FT Alphaville's Izabella Kaminska has had a steady stream of posts - here, here, here and here - while RGE analyst Mary Stokes is a regular follower of the issues - and see again here for some thoughts on the contagion question). Increasing concerns regarding a possible devaluation in Latvia yesterday spilled over into other countries in CEE. Although the direct link between the Baltic markets and others such as Poland, Hungary and Romania is very limited it is only natural that concerns over the situation in Baltic States triggers renewed concerns regarding the position in Central and Eastern Europe where many countries to a greater or lesser extent face problems similar to those in the Baltics. Those most at risk from negative spill-over effects are Latvia’s neighbours Estonia and Lithuania although we would expect contagion to affect countries in the region most like Latvia in terms of macroeconomic imbalancessuch as Romania and Bulgaria. 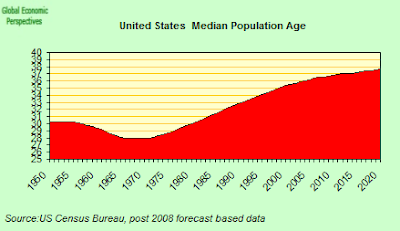 Personally, I think it possible that the immediate contagion risk may be being a little overdone at the present time. Certainly there will be immediate implications from any eventual Latvian devaluation for Baltic neighbours (and co-peggers) Estonia and Lithuania, and well as for more distant Bulgaria. A Latvian decion to break loose will, effectively, be the end of the road for the pegs, even if the unwinding may not necessarily be immediate. And beyond the Baltics and Bulgaria pressure will inevitably mount on other countries facing longer term economic and financial difficulties like Hungary and Romania (which may leave you asking just who exactly there is left inside the EU but outside the Euro - Poland and the Czech Republic to be precise), but my personal feeling is that while we may see everyone placed under stress we are unlikely to see dramatic short term "negative events". If I were looking for these it would rather be towards Russia I would be looking, and to the future path of oil prices, since if things were to go the wrong way on that front then the shock waves from Russia could easily destabilise all the rest of Central and Eastern Europe at one foul swoop. 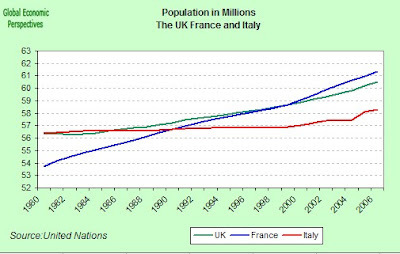 But then, my relative lack of alarm on the contagion front stems from my perception of the present crisis in the East as less one of short term liquidity and balance of payments pressures, and more one of a longer term sustainability issues, given the relative poverty of the region when compared with West European neighbours, and the rapid population ageing and decline issues it is facing. 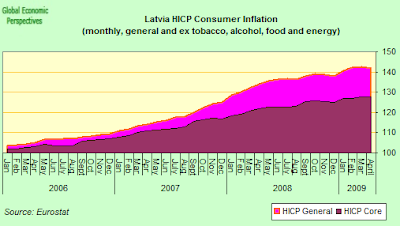 Latvia is certainly hemmed in on all fronts at the moment, what with the 18% year on year GDP contraction registered in the first quarter, the projected 9.2% of GDP fiscal deficit for 2009 (if more cuts are not made), the rise of overnight interbank interest rates into the high teens, soaring credit default swap rates - Latvia's five-year credit default swap rose to a high of 721.1 basis points on Thursday - and almost vanishing Lati liquidity inside the country. But over and beyond the immediate concerns, and contagion risk Latvia is currently a test-bed for a number of issues with implications which extend well beyond the borders of this small Baltic country. In particular three questions stand out. b) The idea of "internal devaluation" as a viable strategy for carrying out a substantial correction in relative wages and prices for a country with a currency peg and large balance sheet exposure to foreign exchange loans. Now it may well be that currency peggars are likely soon to become an extinct species, given the difficulties they tend to produce when such pegs unwind, but the Baltic countries may still be considered as test cases for others who don't (for whatever reason) have an independent currency and thus a serviceable monetary policy. Countries like Ireland and Spain, for example, who are facing a sharp correction, but being inside the eurozone currency area have no local currency of their own to devalue and are hence now destined to follow a similar path to the one being pioneered in the Baltics. 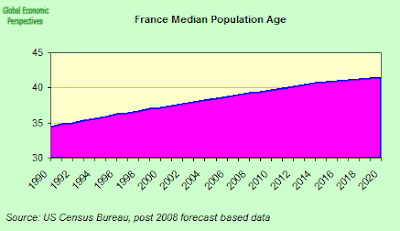 c) The idea that structural reforms can - in the context of a country with long term low fertility, declining working age populations and rising elderly dependency ratios - free up sufficient growth potential to offset the underlying population dynamic and, as the IMF put it in the above citation, credibly signal the possibility of future public sector solvency. So Latvia is at the heart of a massive experiment, of the kind which lead me to lament on my about page that "Economists hitherto have tried hard enough and often enough to change the world, the real difficulty however is to understand it." Since the question I cannot help asking myself in the Latvian context is: to what extent do we really understand what we are doing here? 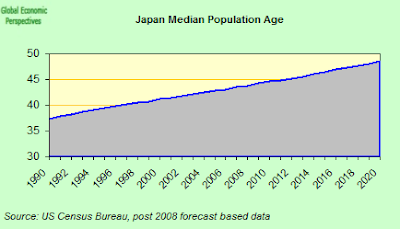 The thing is, all of the above mentioned theories - "internal devaluation", "stimulatory fiscal tightening" and structural reforms to offset declining working age population - sound splendid enough, but are the the theories themselves actually valid? How do we test them? And do the measures adopted on the basis of "believing" in them actually work? And are there sufficient grounds for accepting both the validity of the thoeries and the efficacy of measures based on them to ask for sacrifice on the scale that is currently being demanded from the Latvian people? And do we have any consensually agreed benchmarks which would enable us to decide whether the measures are working? Do we indeed - and by "we" here I mean the EU Commission and the IMF - have any inspectable performance indicators against which to measure progress? Certainly, for every inch of success that is painfully clawed forward (the positive CA balance, for example), we seem to be constantly thrown back a yard by a host of additional problems (the growing fiscal deficit issue, etc), and not for the first time, we - the economists - find ourselves playing with fire, when we, of course, aren't the ones who risk getting burnt in the process! Both the European Commission and InternationalMonetary Fund (IMF) have been busying themselves over the last week making extensive statements on Latvia's 2009 budget amendment process - which is, after all - what lies at the heart of the issue. What has been notably absent however in all these public declarations, is any indication about when exactly the much needed money will arrive. And this is not a request for information simply at the convenience of Latvian lawmakers, it is the sort of information market participants badly need to receive in order to take the kind of decisions which would bring the situation more back under control for the Latvian authorities, and meantime the ambiguity continues. European Economic andMonetary Affairs Commissioner Joaquín Almunia said in his prepared statement he believes the new budgetary proposals to be a step in the right direction. But how much of a step are they, since he also stressed that more was still needed to contain the rapid increase in the budget deficit. So again, just how much more is needed, and are Latvia's politicians capable of delivering? Or is the pain simply too much to stand? authorities want to control government debt and maintaintheir exchange rate peg. On the other hand, Caroline Atkinson, the IMF's director of external relations, restricted herself to saying the fund agrees with the comments made by Joaquin Almunia to the effect that the supplementary budget presented by the government this week represents an initial move in the right direction. "The government's budget is a first step, and there is more work to be done," she said. Again, how much more work? When directly asked the key question as to whether the IMF would support a depegging of the lat from the euro, she simply stated that the fund hasn't changed its stance. "We have commented before that the situation is challenging and that there is a need for action, and I think the authorities have stressed the importance of controlling the government debt and deficits and maintaining the peg," she said. That is to say, the Fund's position is that on this topic the government decides. On the other hand, with Latvia's financial and currency markets coming under increasingly evident stress, and Prime Minister Valdis Dombrovskis saying the country needs the second portion of the loan by early next week, the Fund remains meticulously silent on when exactly the next tranche will be paid, and on what it would take for them to release the money. Of course, negotiating in public is not the most desireable of things, but then having hoardes of market participants speculating on what you might be saying isn't exactly a comfortable situation either. Marek Belka, head of the European Department at the International Monetary Fund, also limited himself on Friday to saying Latvia may need to make further spending cuts as well as increase taxes if it is to stabilize the economy. The Latvian central bank, for its part, noting all the emphasis on "the government decides" side, and obviously not wanting to be forgotten, issued, for its part, a statement openly defending the currency peg, and warning of "dire losses" for Latvian citizens should the currency be devalued. The bank effectively ticked off public officials and advised them to be more careful what they say when speaking and the national currency and its stability in future. It also took the unusual step of underlining that the central bank was an independent institution, and is the only body empowered to take decisions about changing the currency rate. This was notable, as it could be seen as suggesting that someone else thought they had the ability to take such decisions, and it could also be read as a warning to anyone tempted to think they had such powers. 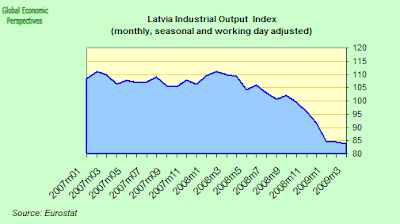 Latvian industrial output was in fact up in April over March - by 4.8% on a seasonally adjusted basis. Mining and quarrying were up by 1.8%, manufacturing by 5%, and electricity and gas by 4.6%. Some sectors were up sharply, clothing output, for example, rose 14.6%, pharmaceuticals by 11.6%, and chemicals by 9.7%. On the other hand electrical equipment was down on March by 19.5%, while other transport equipment (defined as ships and boats, railway locomotives and rolling stock) was down 13.2%. Such stabilisation was consistent with what we have been seeing in other countries, and at this point does not enable us to draw and longer term conclusions. March and a 24.2% one in February. Clearly Latvia's economy is not condemned simply to shrink forever, but it can come to rest at quite a low level, and for it to rebound something needs to drive growth. What I am arguing is, other things being equal, and relative prices being right, that a combination of new investment for greenfield sites directed to axports (which is a plus for private domestic demand) plus the exports themselves could provide the stimulus which starst to turn the motor over. Devaluation is half of the answer here, with the other half coming from having a responsible government, a serious reform programme which encourages confidence in the country and economic and political stability. End all the speculation which surrounds the continuation of the currency peg would be one way to move forward on the second half of the agenda. 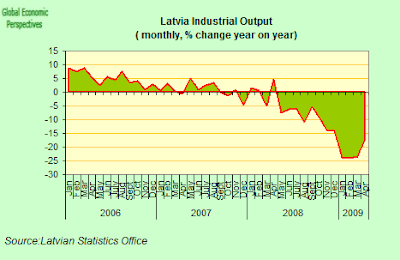 The Latvia statistics office have yet to give us detailed data for Q1 GDP, but they initially reported that the 18% annual decline was broad-based, with manufacturing down 22%, retail trade down 25% and hotel and restaurant services output 34% lower (all from a year earlier). "The economic situation is of course very serious," Latvian Prime Minister Valdis Dombrovskis reportedly told a press conference in Stockholm recently, and who could disagree. 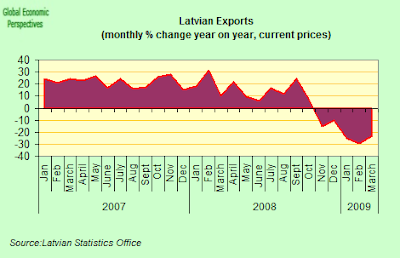 Latvian exports are also well down, falling 23% year on year in March, an improvement on the 29% drop in February, but still substantial. Going by the April industrial output numbers we could expect a further improvement in April too, nonetheless far, far more will be needed to start to turn this situation around. 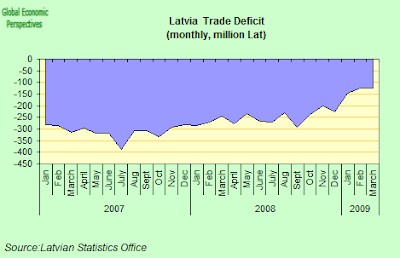 In fact, Latvia still ran a goods trade deficit of just under 400 million Lati in the first three months of the year, down significantly from the 650 million Lati in the last three months of 2008, but still large, especially since GDP is shrinking fast. 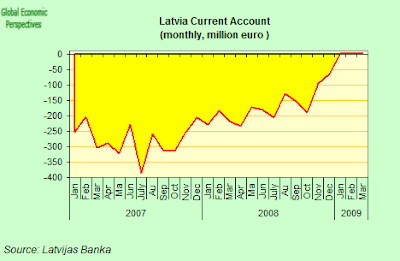 Lavia's current account has however improved spectacularly, and was back in surplus (although only marginally) as of January this year according to central bank data. 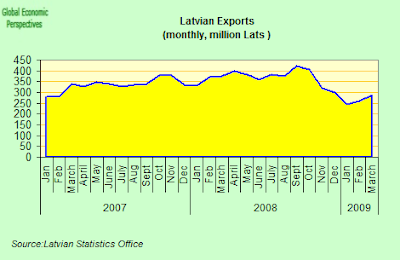 This transformation is entirely logical and anticipated (even if the speed of the correction was not), since Latvia is now about to become a net saver, with a current account surplus, and with an economy which is driven by exports, which at the end of the day is what the whole devaluation debate is all about. And secondly we have movement in the income balance, from deficit to surplus, and this, ironically, is produced by the fact that the internal collapse in economic activity means that the income return on Latvian investments (equities, profitability of enterprises etc) has dropped much more than the return on investments made by Latvians outside the country (where things may also be bad, but not as bad as they are in Latvia). Thus ironically, Latvian's who have had the foresight to borrow funds from the Latvian branches of Swedish banks to invest in economic activities in Sweden may well be faring rather better than those very banks themselves who lent money to be used in Latvia. Apart from the drop in imports, perhaps the best short term indicator of the contraction which is taking place in internal demand is to be found in the retail sales numbers. These were actually up slightly in March compared to March - by 0.3%, on a constant price seasonally adjusted basis. The improvement was largely in the sale of food products, which increased by 2.7% on the month, while sales of non-food product fell by 1.1%. Compared to April 2008 however sales were down by 29.6% (working day adjusted, constant price data), following a 27.3% fall in March. Since April last year seems to have been the peak month, we can expect the annual drops to reduce, although the actual level of sales may well keep falling (see chart below). Apart from the credit crunch and the consequent difficulty in borrowing money, the other factor which is producing the slump in retail sales is the dramatic rise in unemployment, which according to Eurostat data has surged from a low of 6.1% in April 2008 to the present 17.4%. And it continues to rise. The Eurostat numbers are rather different from the Latvian Labour Board ones, since the latter is based on a different methodology (and is thus not part of any "sinister conspiracy" to hide the facts - for a full discussion of the issues involved see my recent post on the same issue in Spain), but if you compare the charts, the undelying trend is evidently similar, a sharp upward climb. The principal conclusion we can draw from all this then is that it would be foolish to expect any recovery in economic activity to come from Latvian domestic demand, and this problem will only be added to by the impact of debt deflation on houseowners who, according to Global Property Guide, have just seen their properties fall at the fastest rate anywhere on the planet - it wasn't that long ago that Latvia and Estonia were leading everyone up - with prices down by 50% year on year in the first quarter, and the drop over the last quarter of 2008 being an incredible 30%. 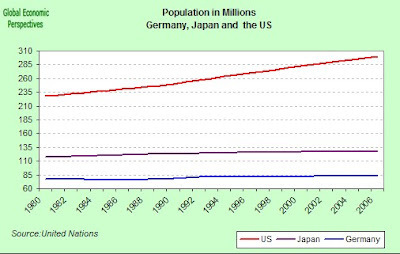 So we need to look to exports. 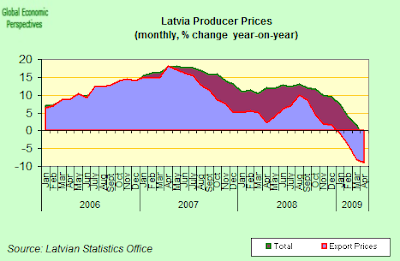 But this is where we hit a problem, since all the inflation which took place during the boom side of the boom-bust have made Latvian prices and industries totally uncompetitive when it comes to its main trading partners. If we look at the latest Real Effective Exchange Rate Data (curiously enough released by Eurostat last Friday), it should not surprise us to learn that the worst loss in competitiveness occured in 2008. 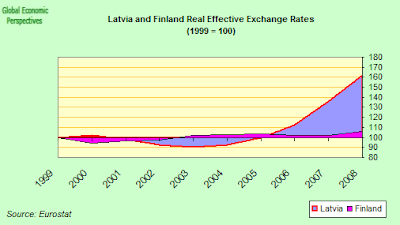 The above chart compares Finland and Latvia, and gives us an idea of just how much competitiveness the Latvian economy has lost since the index was set in 1999. In fact the graphs are even more interesting, since we can see that there was a period - between 2002 and 2005 - when, despite the fact that living standards were rising, productivity was rising faster, and Latvia actually improved its competitiveness vis-a-vis Finland. It is that earlier dynamic which now need to be recovered. 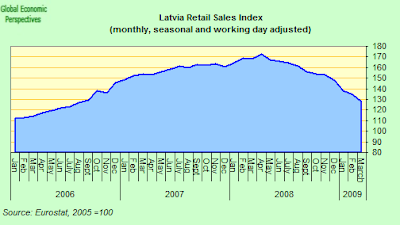 But as we can see from the sharp upward rise the the Latvian REER post 2006, the structural damage has been substantial, and this large scale of the correction needed makes the "internal devaluation" path - even if it were working, and even if markets were accepting it, which in neither case is true - particularly onerous. 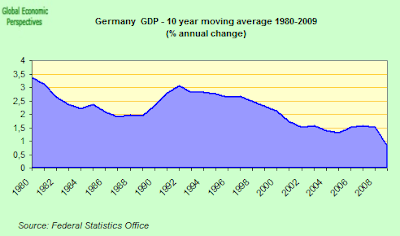 Prime Minister Dombrovskis himself estimated only last week that any devaluation would need to be of the order of 30% (and looking at the chart it is hard to disagree), and this is already much larger than the 15% "adjustment" in the trading band the IMF were considering during the original loan negotiations. 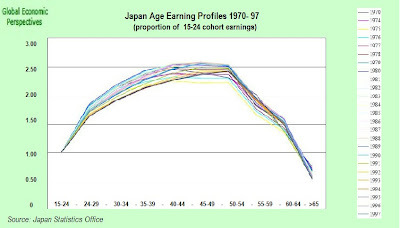 Ideally improvements in competitiveness can be achieved in two ways, through productivity enhancements which can be attained via structural reforms, and through changes in the wage and price level. 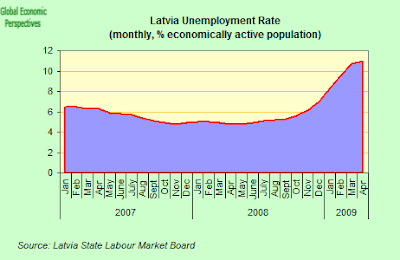 Unfortunately the former needs time to work, and time is now absolutely something Latvia hasn't got, with the recession biting deeper by the day, and the markets hot on the heels of the government. So we need the wage and price correction. Well, people have supposedly been working on this for some six months or so now, so just how far have we got? Let's take a look. 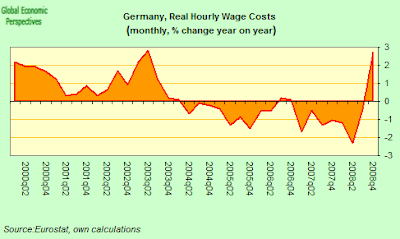 Well, if we look at average gross wages and salaries, they fell 1st quarter of 2009 by 6.2% over the last quarter, but when compared with the first quarter of 2008 they are still up - by 3.5%. Of course, given the rise in unemployment the actual volume of wages and salaries paid is down even more - by 10.9% on the year, and by 17.2% over the last quarter. 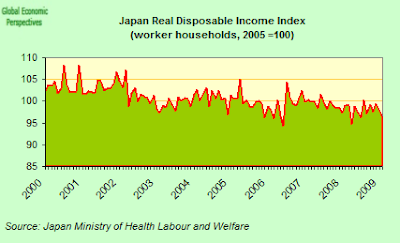 But this is a dop in living standards produced by the recession, and not a fall in unit labour costs. 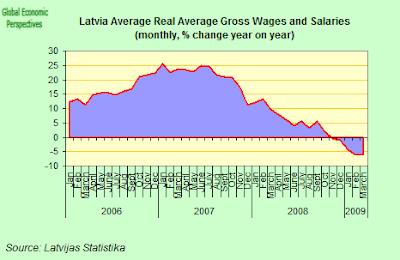 In fact, according to data from the Latvian Statistics Office, the level of gross wages and salaries has so far only fallen back to the level of August 2008. This contrasts with a lot of anecdotal evidence I have been receiving in comments which speak of far larger reductions, but there you are, that is what the data says. 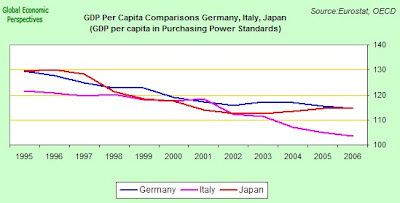 But restoring competiveness via internal devaluation is about reducing wages and prices in like measure, it is not simply about reducing wage costs, since slashing wages without reducing prices is only to cut living standards, and this in and of itself serves no evident purpose, and indeed causes untold hardship.So how are things going with prices? Well, not much better. According to the statistics office, as compared to March, the average consumer price level in April was down by 0.4%. The average prices of goods decreased by 0.3%, but compared to April 2008, consumer prices still increased, and were up by 6.2%. In fact both the general and the core idexes (by core I mean ex energy, food, alchohol and tobacco) were still above the January level, so on the consumer prices front we have yet to take even the first step into attacking the loss of competitiveness reflected in the 2008 REER. What about producer (or factory gate) prices then? Well, here the situation is a bit better, since as compared to March, April producer prices were down by 0.9%, while as compared to April producer prices fell by 2.6% (the first month of year on year drop). In the case of export prices, the situation was even better, since these were down by 9% year on year in April. In fact in both cases (domestic and export) prices have been falling since last July, which is hardly surprising since energy costs (which were a major component in the recent producer price spike) have fallen sharply. 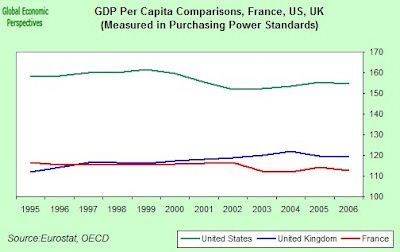 And remember, what interests us here is competitiveness, and energy prices have been falling everywhere. 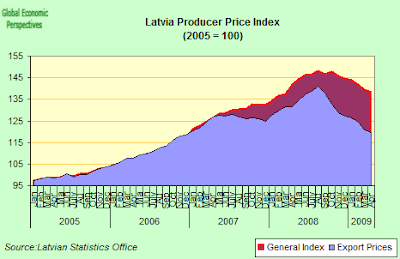 What Latvia needs is to improve its relative prices vis a vis its main reference markets. One indicator of the degree of stress which the Latvian economy is currently experiencing is the way in which bank lending (which fuelled the earlier boom) is now falling across the board. Year on year the numbers are still in positive territory, but the annual lending growth rate is steadily heading for zero - it decelerated to 4.3% in April (of which lending to non-financial corporations fell to a 9.2% growth rate while lending to households was down to 1.3% year on year). But month on month lending is contracting, and has been so doing since October. Loans to resident financial institutions, non-financial corporations and households contracted by 115.9 million lats or 0.8% in April alone. Commercial credit and mortgage lending are both falling (by 3.4% and 0.8% respectively) and the negative momentum continues. Money supply data show a similar tendency, even if in April M3 increased by 67.4 million lats and M2 by 63.6 million lats over March. Nevertheless the annual rate of decline in both measures of money supply continued to accelerate (to 8.2% and 8.1% respectively). M1 - which consists of currency in circulation + checkable deposits (checking deposits, officially called demand deposits, and other deposits that work like checking deposits) + traveler's checks (ie assets that can be used to pay for a good or service or to repay debt) - has been falling now since December 2007. 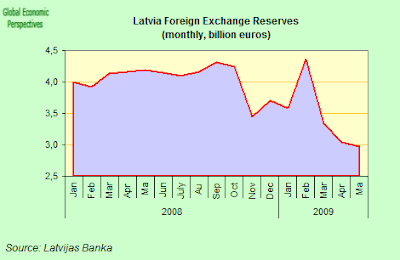 Net foreign assets held by the Bank of Latvia fell by 218.7 million lats in April. According to the central bank the decrease in foreign reserves was a result of Bank of Latvia interventions (selling euro) and a reduction in foreign currency deposit held by the government as it drew down what remained of the last tranche of the international loan. 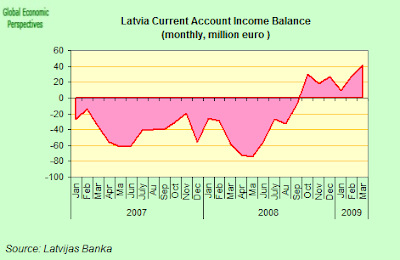 Latvia has now spent about 503 million euros buying lats so far this year to support the currency. The bank had previously spent about 1 billion euros in 11 weeks last year defending the currency prior to the 7.5 billion-euro IMF-lead bailout. Reserves had to some extent been boosted by currency swaps made available by the Swedish and Danish central banks. Indeed only in May Sweden’s central bank raised the amount of euros available for its Latvian counterpart to swap for lats to 500 million euros and extended the term of the agreement. The swap agreement dates back to last December, and allowed the Latvian central bank to borrow up to 500 million euros for lats. Under the original agreement the Riksbank was to provide 375 million euros and the Danish cb 125 million euros. However, according to the most recent statement from Swedish Finance Minister Anders Borg the Swedish government have now decided: so far and no further (see below). 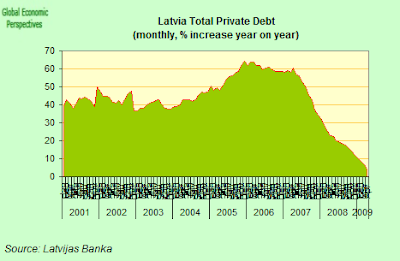 As noted at the start of this post, Latvia is now suffering from a major Lat liquidity squeeze. And the shortage of lati on the internal market lifted has steadily been lifting interbank rates. One indication of the shortage was the inability of Latvia’s Treasury during the week to sell bills at a first auction at which 50 million lati (35 million euros) were offered. The Treasury did finally manage to sell a much smaller quantity (2.75 million lats - 4 million euros) . The problem is not one of price (yield) but of liquidity - there is simply a shortage of lati in the system overall as those who have the local currency sell and buy euros to protect against possible devaluation. The lack of liquidity pushed Latvian interbank lending rates to their highest levels on record on Friday as the central bank removed lati from the market in an attempt to stem speculation. 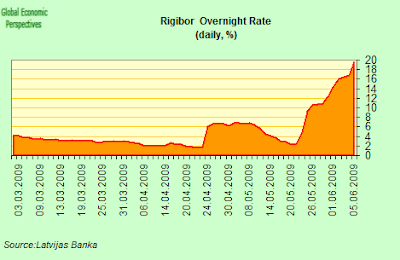 The six-month Rigibor rate rose to 16.00 percent. The three-month rate rose to 17.92 percent while the overnight rate rose to 19.6 percent. Obviously with levels like this devaluation becomes inevitable, but as Dombrovskis stresses: “This was a momentary situation and the moment when we have an agreement with the international lenders the market will calm down,” - for the time being at least. The critical question at this point is not whether a new agreement with the EU and the IMF is possible (it surely is), but rather whether it is worth the effort, since the government may well be in a situation were it is forced to agree to a series of extremely painful cuts only to find itself in the very same position three or six months from now. b) a serious adjustment in relative wages and prices which converts Latvia once more into an attractive destination for export oriented investments. At the present time we have the worst of both worlds here, since all the government's time, energy and attention is being focused on short term fiscal objectives, while the rate of price adjustment is far too slow. That is, the existing programme is NOT working, and I find myself wondering, do the IMF representatives have performance criteria, and if so what are they? And are these (assuming they exist) being in any way fulfilled, since the only visible positive outcome at this point is the recovery of a current account surplus, but if this is being achieved at the price of generating a massive fiscal deficit, then it is hard, really, to cry victory. The general government consolidated budget showed a deficit of 190.8 million lats in April, with an accumulated deficit since the start of the year of 332.8 million lats). According to the central bank, the deterioration in the general government consolidated budget was largely the result is two processes: a) a revenue fall of 24.7%; and b) an increase in expenditure of 15.9%. Tax revenues were sharply down in all tax groups, with corporate income tax, VAT and personal income tax revenues dropping most (by 84.9%, 26.9% and 15.5% respectively). The expenditure surge was primarily fuelled by payments of subsidies and grants which expanded by 70.3%. Rising expenditure for social benefits (by 26.2%) and the growth in interest expense (84.7%) were other significant contributors. General government gross debt increased by 143.2 million lats in April (to 3 119.0 million lats). The consensus is that the current budget as agreed in a first reading before Latvia’s parliament last week implies a deficit of 9.2% of gross domestic product. It is anticipated that spending will be cut further via ammendments in the second reading scheduled for June 17 and that these should be sufficient to obtain additional disbursements from the European Commission and the International Monetary Fund. The question is not really (at this point) whether the Latvian parliament will pass the ammendments, but whether Latvia can hang out that long in the absence of stronger verbal and substantive support, and whether the measures if implemented will have the anticipated results. On the latter point, as I have already indicated, I am extremely sceptical, and on the former, as we have seen statements from both the EU and the IMF have been much softer than might have been hoped for, while one leading ally (the Swedish banks and government) have now taken a much more ambiguous stance. Swedish Finance Minister Anders Borg described the situation in Latvia as “markedly worrisome” in a statement on the Swedish government website at the end of last week. However, when it came to practical measures Borg was a lot less forthcoming, limiting himself to stating that Sweden would not offer Latvia any additional bilateral loan over and above the current contribution to the international bailout, adding the in his opinion the most important step forward was a show of determination by the government to rein in the budget gap. “They have to show that they have control over their public finances”. It is of the “utmost importance” that Latvia take “concrete and well-defined” additional measures to limit its public deficit to ensure that the IMF and the European Commission resume loan payment, he told reporters last week. Well , this is very hard to say, but certainly the omens - and especially Friday's Rigibor overnight reading - do not look good. There is now evidently a growing consensus among observers that some sort of devaluation is well nigh inevitable, with the only real question being when. Certainly the trading community seem to be anticipating such a move, and forward contracts now price the lat some 53 percent below its current spot rate of 0.7073. Bloomberg quote fund manager Paul McNamara , from Augustus Asset Managers, as stating that “There seems to be a reasonable market consensus that Latvia will devalue", and I think this is a fair view. Caroline Atkinson, director of external relations for the IMF, limited herself to describing the economic situation as “challenging", adding that there was clearly "a need for action.” She also pointed out the need for flexibility, which could refer to the IMF and the budget limit, or could refer to felixility on the part of the government, given the fact "the authorities have stressed the importance of controlling the government debt and deficits in maintaining the peg." The problem is not that the IMF and the ECB would cease to support the Latvian government if they choose to continue down their chosen path, the question is really will they be able to continue down their chosen path, and indeed does it any longer make sense for them to do so? During this whole process one thing has become abundantly clear from the IMF statements, for the Latvian government's chosen path to be viable, there needs to be an exit strategy. Really it is very well worthwhile everyone reading the recent interview with IMF Survey Magazine (end of May) given by the IMF’s new mission chief for Latvia, Mark Griffiths, and Christoph Rosenberg, advisor in the IMF’s European Department and coordinator of the IMF’s work in the three Baltic Republics, since it makes a number of things very clear. "Let me first stress that this is the authorities’ program—they have very strong ownership of the policies that underpin it." and secondly, having a viable exit strategy is central to success. "The alternative strategy—abandoning the peg—would also be associated with large economic short-term costs. 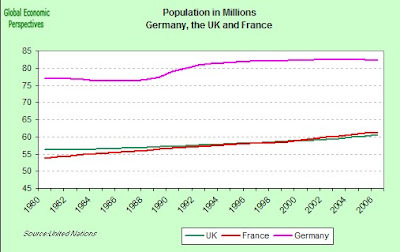 That is clearly one reason why there is such a strong preference in Latvia for maintaining the peg. 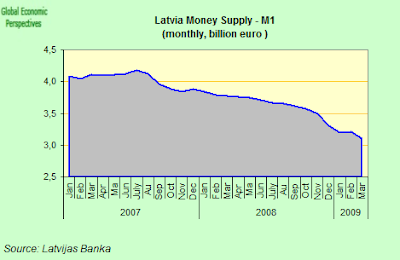 Latvia also has a clear exit strategy in place: meeting the Maastricht criteria and adopting the euro by 2012." But really, we now need to ask, is this exit strategy still viable? Certainly on the current path it may be possible (on the back of very considerable sacrifices on the part of the Latvian people) to bring the deficit down below the 3% limit in 2011 (although whether the EU Commission and the ECB would regard this as a sustainable process is another issue), but what about the 60% gross debt to GDP ratio? In their April forecast the EU commission pencilled in debt to GDP at 50.1% in 2010 (up from 9.0 in 2007 and 19.5 in 2008). That is debt to GDP is rising very fast (indeed some might say exploding). 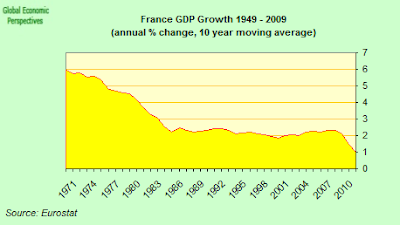 At the same time this 2010 estimate, which already makes being within the 60% limit in 2011 a reasonably close call (too close for my comfort anyway) is based on GDP contractions in 2009 and 2010 of 13.1% and 3.2% respectively, and we already know that the contraction in 2009 will be significantly greater than the EU forecast. But it is worse than this, since not only is GDP contracting, prices are also falling (in fact, under the "internal devaluation" scenario this is what we want). 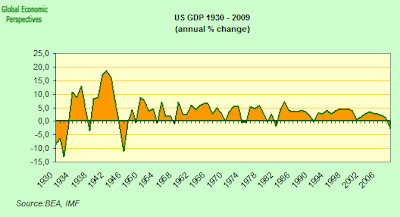 But what this means is that nominal (or current price) GDP will fall faster than real GDP, with consequent negative consequences for the debt to GDP ratio (since as GDP falls, the money value of the debt remains constant). 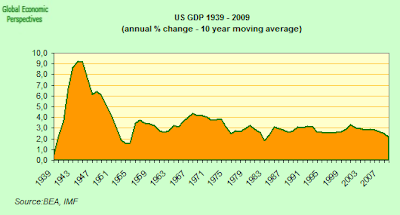 In fact the more successful the price correction the higher short term debt to GDP will rise. 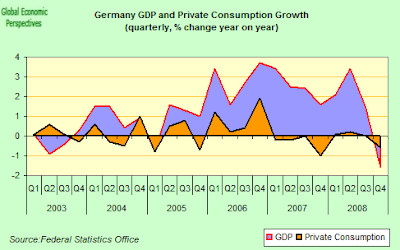 At the present time the EU forecast GDP deflators of only minus 2.2% in 2009 and minus 3.6% in 2010. But as we have seen above, for growth to return to the Latvian economy prices need to correct by far more than this, and hence debt to GDP will inevitably rise more than forecast - either because prices don't correct fast enough, and hence GDP contracts more (worst case) or that they correct rapidly (but with negative consequences for debt to GDP. This looks suspiciously like a Maastricht lose-lose to me. That is, the simple fact of the matter is that there is no exit strategy. The programme simply doesn't work. It is "overdetermined", since whichever way you look at it, there is always one more problem than there is solution. Gentlemen. I think its time to give up. Honourably, but to give up. Come on out of the bunker, white flags and hands in the air will not be called for. There's a world out here waiting for you, it's on your side, and there will be a tomorrow.